It's Shimmer and Shine Party Time! Have a glitter-tastic birthday party with these adorable twin genies! Let Shimmer and Shine bring glittery sparkle to your party with our awesome party printables! From invitations to party games, we have everything you need for a magical birthday party. 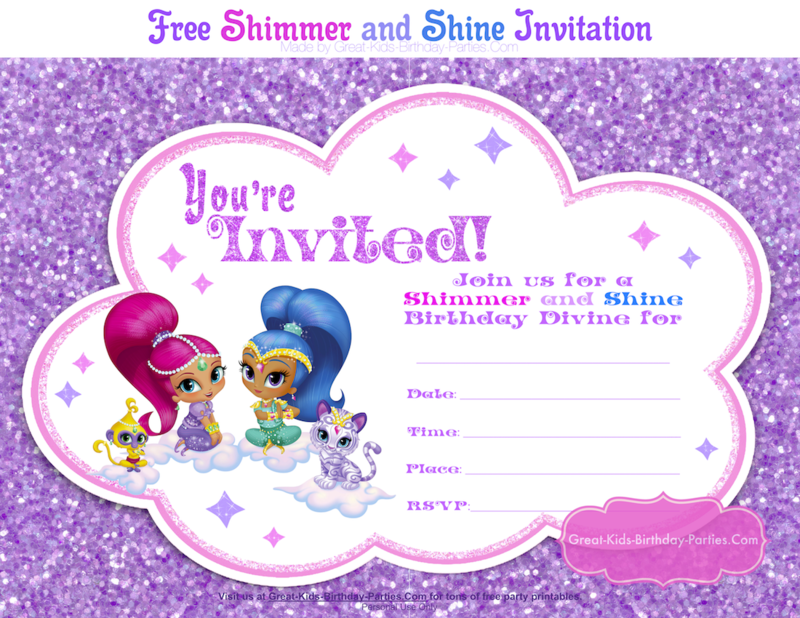 Start your zahra-mazing Shimmer and Shine birthday party with our cloud invitation! Nickelodeon's Shimmer and Shine fans will love our fun invitation and get guests ready for a magical and glitter-tastic birthday bash! Download your free invitation and let the birthday divine begin. Want to make your own Shimmer and Shine invitations? Grab our free template to start your party planning. Invitation template is size 5 x 7. Download your template here. Have a divine celebration! Need some genie divine inspiration for your Shimmer and Shine birthday party? Start with our free birthday sign and cake topper to plan your glitter-tactic birthday bash! 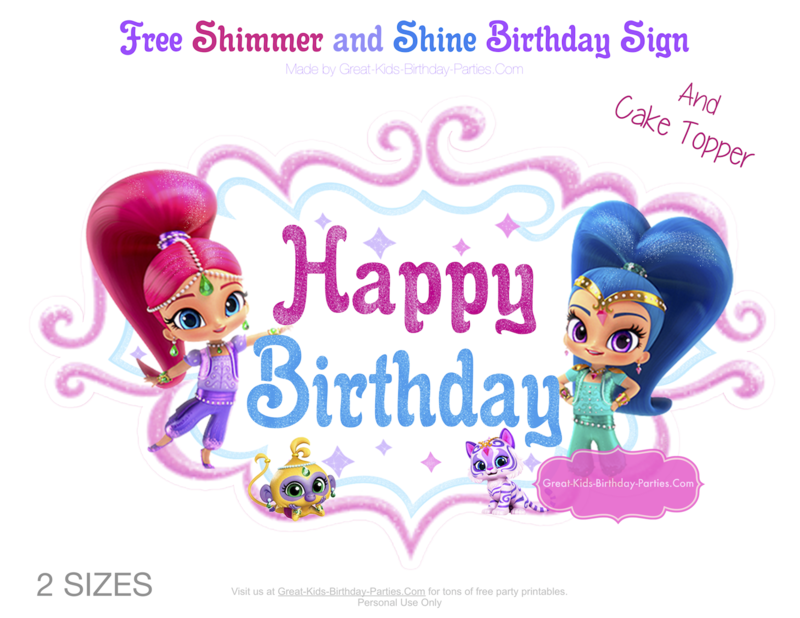 Download both Shimmer and Shine sign and cake topper for a magical celebration! 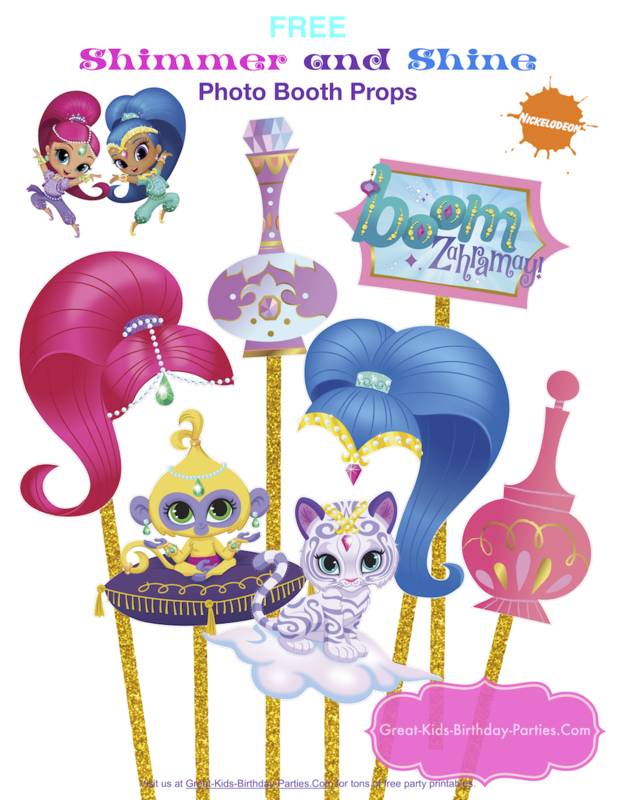 Make some zahra-mazing memories with this Shimmer and Shine Photo Booth props set from Nickelodeon! 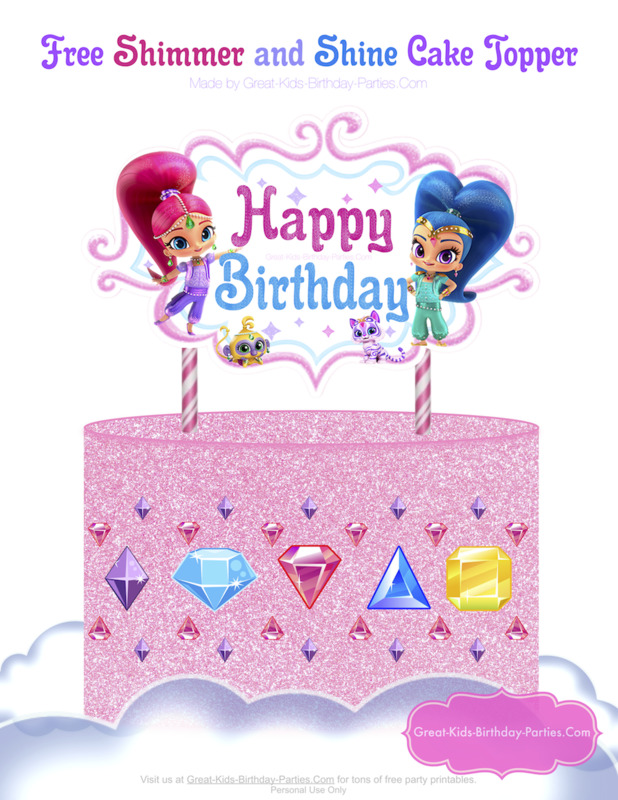 This beautiful 7-piece printable set is perfect for a Shimmer and Shine birthday party. Download your free printable here. 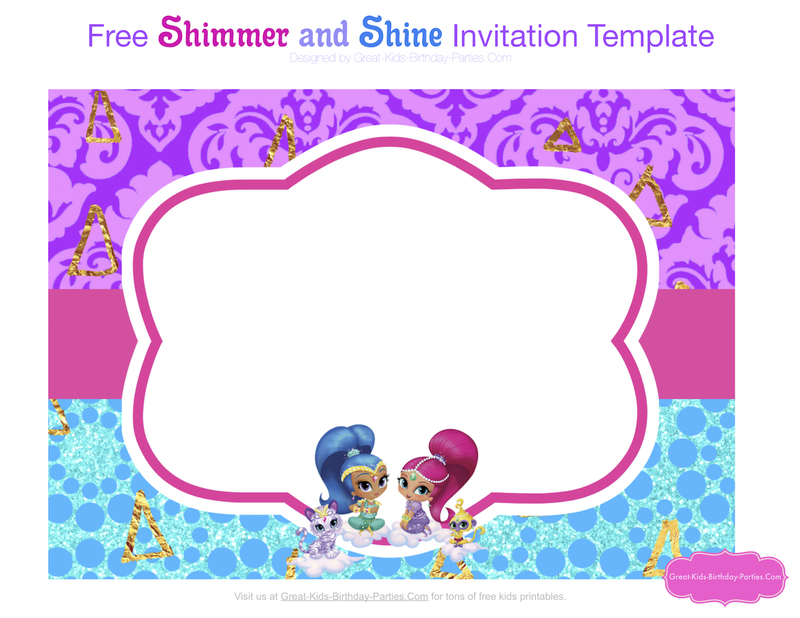 Want to make your own Shimmer and Shine party printables? Grab our free Shimmer and Shine blank logo to make your own invitations, cake toppers, thank-you tags, water bottle labels, cupcake toppers, and lots more! Come fly in a magic carpet ride with our Shimmer and Shine Thank-You tags. Each tag is 4 inches wide (tassel to tassel) and comes with Shimmer and Tala. Prints 6 per sheet and best of all....they're free. These tags are versatile and can be used by gluing them to the front of your goody bag or hole punch and put a sparkly string to tie to goody bag. 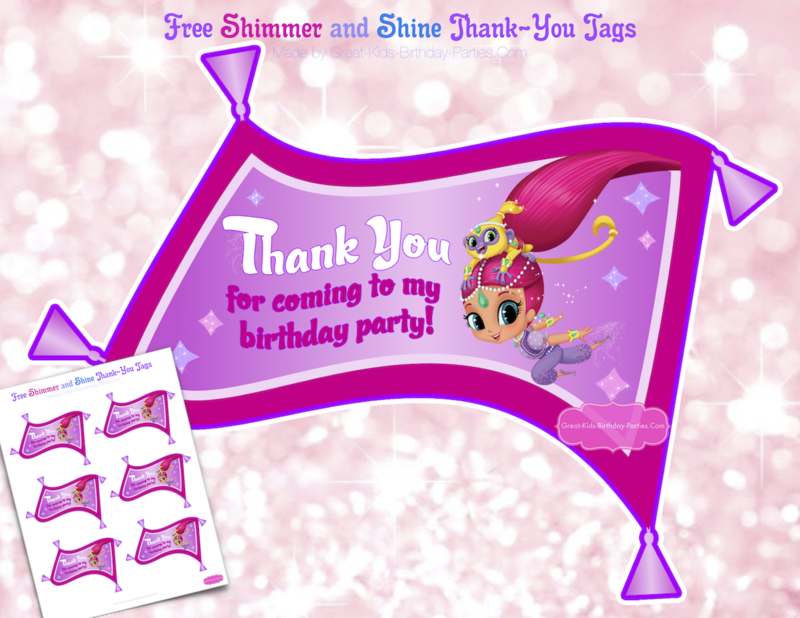 Download these printable thank-you-tags for your next Shimmer and Shine birthday party. Love this Shimmer and Shine coloring page from Nickelodeon. These printable placemats are great for a Shimmer and Shine birthday party. Use them at the children's table or roll them up as part of your party favor bag. 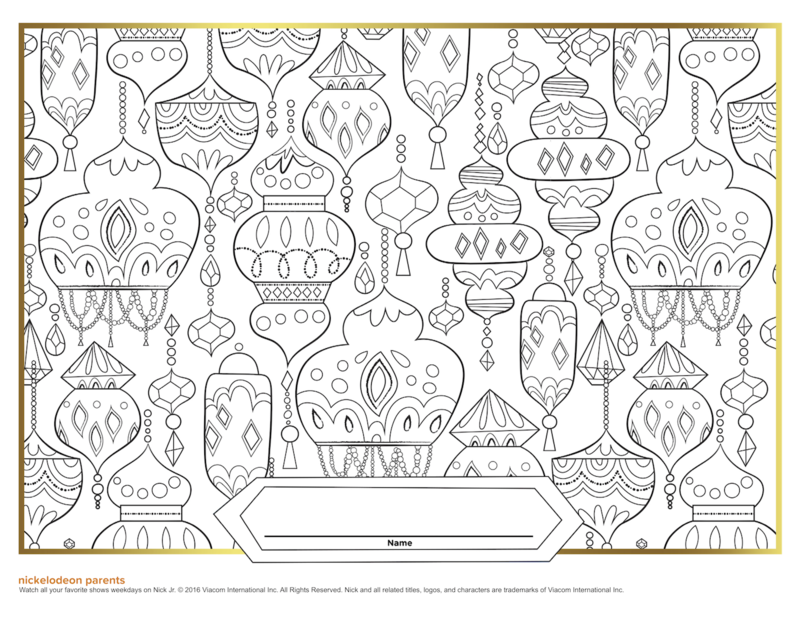 There is lots to color in this beautiful coloring page placemat. Click on image for download. 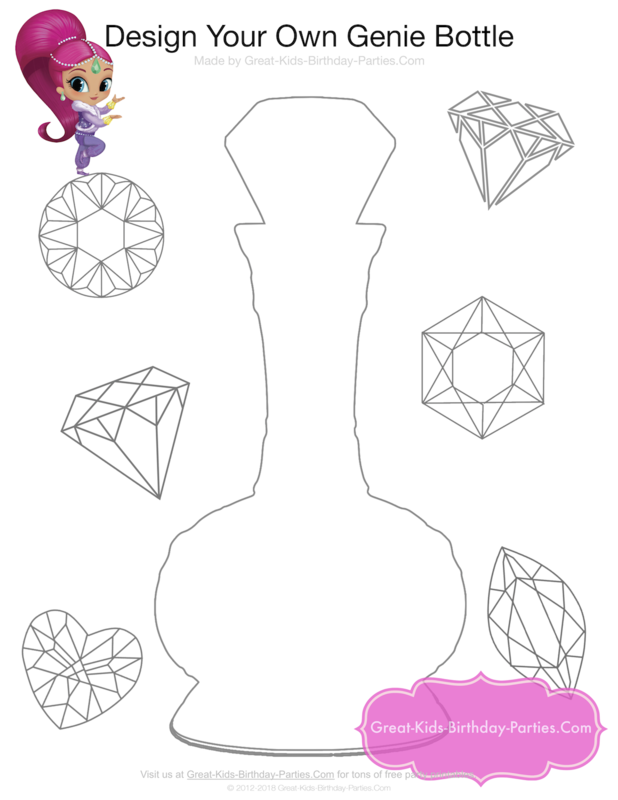 Kids can design their own genie bottle with our genie bottle template. We added 6 beautiful gems for extra coloring fun. Download your free printable here.